CLEAN DECIMATE is NATURAL. Cygen Labs means business! 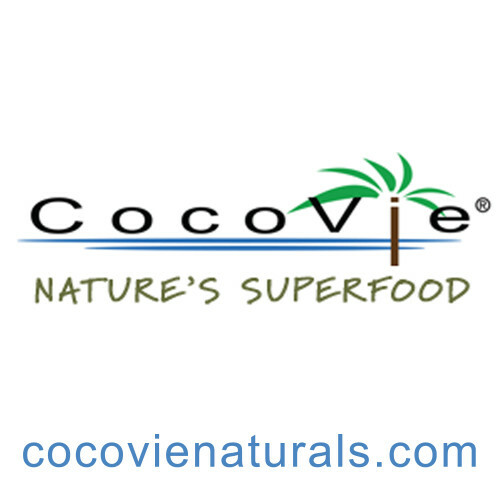 There are NO artificial colors, scary chemicals or fillers! Springing out of bed some mornings can be daunting. For those who haven’t incorporated training into their regular routine, it’s even more problematic. Decimate changes all that! Increase energy everyday in one simple step! Enjoy summertime taste of POM-BERRY LEMONADE all year long. Scoop, sip and set your sight on gym goals. Lazy is easy. Giving up is easy!! Giving up is not an option for my clients. Like many, Wendy has lived in many different body types over the last four decades. She has been fit followed by pregnant to stage ready and her most recent, “I have no time to train and eat properly!” physique. Loving your body is linked to choices made day in and out. It’s not complicated. Katharine Hepburn said it perfectly. “You are the only person you can actually change!”. Wendy decided 2017 would begin a new transformation. Sheer determination followed by a daily dose of CLEAN DECIMATE. We share an online mission to return fit to her fabulous self. Wendy has found success by focusing on daily achievable fitness and food goals. It shows! Wendy is clearly well on her way to her former FITNESS STAR stage self! CLEAN DECIMATE is an integral part of her success. L-ARGININE is an amino acid helping stimulate the pituitary gland. This leads to the production and secretion of growth hormone. Benefits of L-arginine include enhanced muscle building, strength and fat burning. Body Building community are long time supporters of supplementing with L-arginine. BETA-ALANINE is an amino acid that helps prevent muscle soreness by acting as an acid buffer in active muscle. It is also linked to improved endurance and performance. WILD GERANIUM is a beautiful flower native to Eastern North America. Cygen Labs uses all parts of this wild flower including its tannin rich roots. Tannin is known to soothe minor gastrointestinal disturbances, relieve inflammation and headaches. Holistic healing properties of wild geranium are not new. It’s anti-diabetic, helps improve kidney health and even treat gout. Incorporating herbal wisdom in CLEAN DECIMATE sets it apart. Wild geranium works as an adaptogen, helping decrease anxiety. Helping balance hormones may decrease symptoms of menopause. Wild geranium is anti- inflammatory and improves circulation. 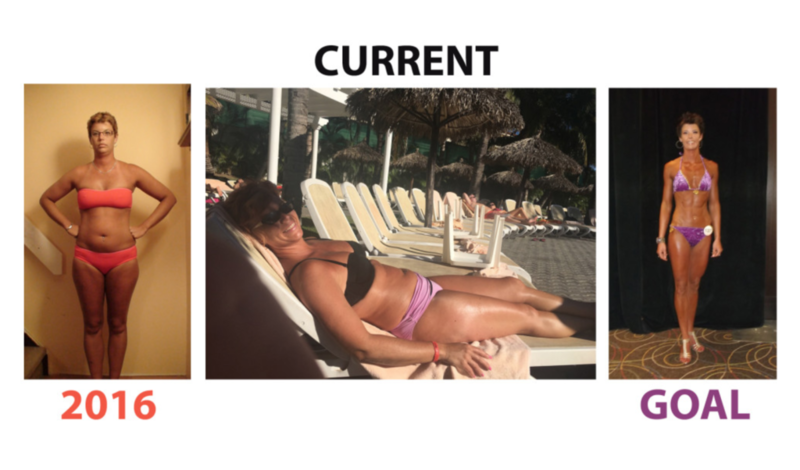 Personally, I noticed improvements in my skin. It’s not surprising according to natural skin advisor, Shelby Ondrus, RHN and owner of Shelby Naturals. When hormones are balanced, release of stress hormone cortisol is decreased. Beautiful clear skin is a bonus! TAURINE is an amino acid which moves potassium, sodium, calcium and magnesium in and out of cells. Sodium and potassium are directly related to balancing water. Holding water is problematic visually for fitness, bikini and body building athletes. Holding water may effect weigh-ins but can also jeopardize performance output. Calcium and magnesium is aided by taurine. These two minerals work in balance to generate nerve impulses. Taurine is also linked to maintaining our internal fire or metabolism. CREATINE HYDROCHLORORIDE: Creatine is stored in muscles as phosphocreatine but broken down into creatine and phosphate. Phosphate molecules join ADP to make ATP. The bottom line is simply, ATP is energy. As creatine reserves decline, muscle fatigue sets in. Training becomes more challenging each minute. During high intensity exercise, the body needs rapid resynthesis of ATP(energy). 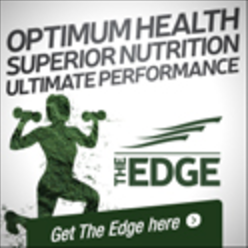 Having higher concentration of creatine stored ahead, allows muscles to contract longer. Creatine helps maintain balance in muscle cells between ATP and creatine phosphate. 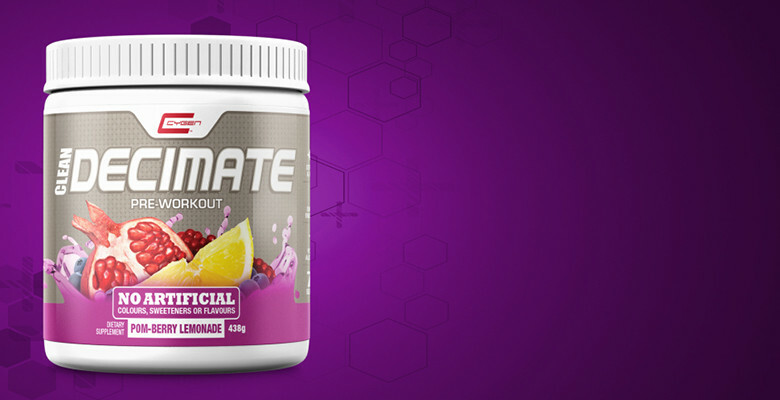 Addition of creatine in CLEAN DECIMATE helps enhance training and performance. Diet containing meat, eggs and fish will contain creatine. Vegans and Vegetarian diets don’t contain creatine. They must eat a diet containing enough of the amino acids arginine, glycine and methionine in order for the body to synthesize creatine. Supplementing is highly beneficial. Creatine is highly recommended for athletes looking to improve training. It helps increase muscle mass and burn fat. Adding daily dose of creatine helps the mitochondrial or power house of the cell produce additional ATP or energy!!! CAFFEINE is the key for many athletes. I am a personal fan of the caffeine kick. I find aproximately 30 minutes before any type of training works best. Caffeine stimulates the central nervous system offering athletes a quick source of physical energy as well as mental boost. For those athletes that SAVE caffeine as part of their pre-workout protocol, it’s especially effective. DECIMATE contains 150 mg which is comparable to 8oz of brewed coffee. Better to skip the java throughout the day….Get your gym groove in gear with DECIMATE! 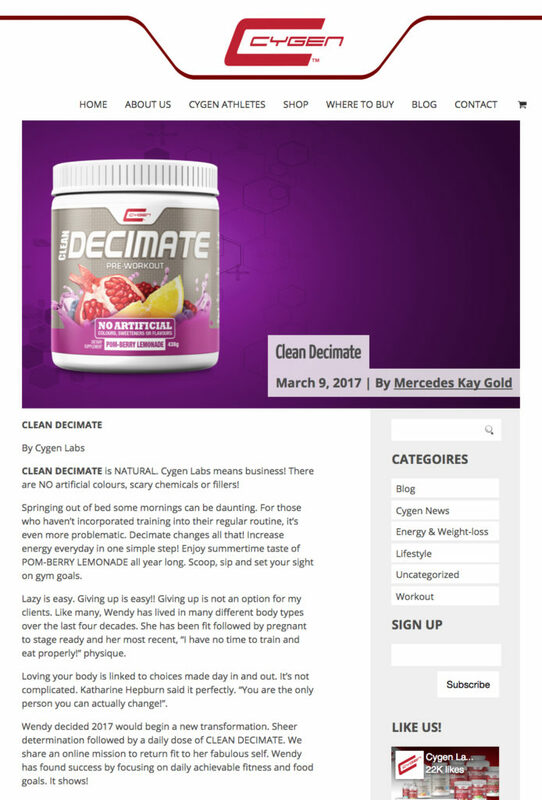 CLEAN DECIMATE brings it all together for men and women! 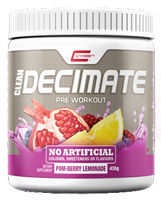 Whether you take one scoop or max dose of two daily, CLEAN DECIMATE helps you train out-of-this-world! Decimate is not recommended for pregnant or nursing women. Always consult a MD, ND or trusted health practitioner before beginning any supplement.